After my less than successful attempts on 6 meters with my collinear array, I decided to try another design that I had been looking at for some time. A quad turnstile consists of two cubical quad loops oriented in a diamond configuration and angled 90 degrees apart from one another with both diamonds sharing the same top and bottom points. The advantage of this design over a single quad loop is that when phased 1/4 wavelength (90 degrees) apart the combination of the two antennas creates an omnidirectional radiation pattern. This type of antenna can also be made from two crossed dipoles, however, using full wave loops instead of half wave dipoles provides about 1 dB additional gain at low elevation angles (there is a great article about building a 6 meter quad turnstile written by L. B. Cebik, W4RNL in the May 2002 QST magazine that goes into further detail about the performance and advantages of this antenna design). Another advantage, from a construction perspective, is that the spreaders required for a dipole turnstile would have to be 10 feet across. The spreaders for quads only need to be 7 feet across meaning that the use of lightweight pvc is that much more practical. The quad configuration is also perfect for being suspended by a push up fiberglass mast since the antenna is very light weight and virtually all of the loads are directed vertically down the center of the antenna which is also the center of the mast. This results in very little flexing and stress on the light duty fiberglass section at the top of the mast. I built my antenna using the Max Gain Systems MK-6-Standard fiberglass mast which stands 32 feet tall when fully extended. From previous experiments with 6 meter loops I have found that 20 feet of insulated 14 AWG wire is resonant at the bottom of the 6 meter band (just above 50 MHz) where the SSB activity is concentrated. The feed point is the most complex component in the entire antenna. It consists of a piece of 1/4″ thick Lexan with three SO-239 connectors (one for the feedline and one for each end of the phasing line) and four #10-32 stainless bolts (one for each loop end) mounted to it. The SO-239s and bolts are then wired together such that the feedline is wired directly to one loop and one end of the phasing line and the other end of the phasing line feeds the second loop. I used red and yellow electrical tape to mark which bolts attach to which loop. I also notched the Lexan sheet to fit around the mast so that I could wire tie it in place. The phasing line is made using RG-63 coax which has an impedance of 125 Ohms. This is required because the feedpoint impedance of each of the loops is also about 125 Ohms. When fed together via the phasing line the final antenna impedance is approximately 62 Ohms which matches well with the standard 50 Ohm feedline (for this antenna I used a run of 100 feet of LMR400 coax). I purchased my RG-63 coax from The Wireman. The phasing line needs to be 1/4 wavelength long at the bottom of the 6 meter band. To calculate this you can use the formula (246/frequency) = quarter wavelength in feet. Therefore 246/50.5 = 4.871 feet = 58.46 inches. Next we take into account the velocity factor of the RG-63 coax, in this case 84%. Therefore 58.46*0.84 = 49.1 inches which is the length that the phasing light should be including the connectors on each end. The PVC spreaders are made using 3/4″ PVC conduit glued into a 4-way junction box. By drilling a 3/4″ hole in the center of the junction box it allows the spreader assembly to slide down the top mast section and rest on top of the 1″ section of the mast. This is left to float in place and is not attached to the mast in any other way. The key to the construction of my version of a quad turnstile is that the entire antenna hangs from the top of the mast. To accomplish this I used a 1/2″ PVC cross with a nylon bolt running through the center. The bolt slides in the end of the 3/4″ fiberglass mast section and prevents the PVC cross from sliding off the top of the mast. I then fed the antenna wires through the cross such that the wires intersect at 90 degree angles. This method serves to secure the wires to the peak of the mast as well as providing some strain relief for the antenna wires. I then splayed out the wires and ran them through notches cut at the end of the PVC spreaders. I then centered the wires relative to the top of the mast and taped the wires to the end of the spreaders to keep them in place until they are attached to the feed point. The wires were then attached to the feedpoint using ring terminals that were soldered to the ends of the wires. The ring terminals make it easy to connect the wires to the bolts mounted on the feedpoint. To erect the antenna I first raised the top 3/4″ section of the mast until the top wires became taught. This only requires about 3 feet of the top section to be extended such that the spreader assembly is not lifted off of the lower mast section. I then locked the top mast section in place. Next I raised the 1″ section of mast until the lower wires were taught and secured the feedpoint in place with a wire tie and taped the feed line and phasing line to the mast for strain relief. Then I continued raising each mast section until the mast was completely raised, resulting in a peak height of nearly 30 feet. I then finished guying the mast. For this antenna I only guyed the mast at 3 intervals, the bottom, the middle, and the top since the antenna is not heavy and is very evenly loaded on the mast. Three guy lines per interval were used made from UV resistant rope anchored using 10″ spiral ground anchors. This resulted in a very stable mast and the antenna that has held up well, even on breezy days. 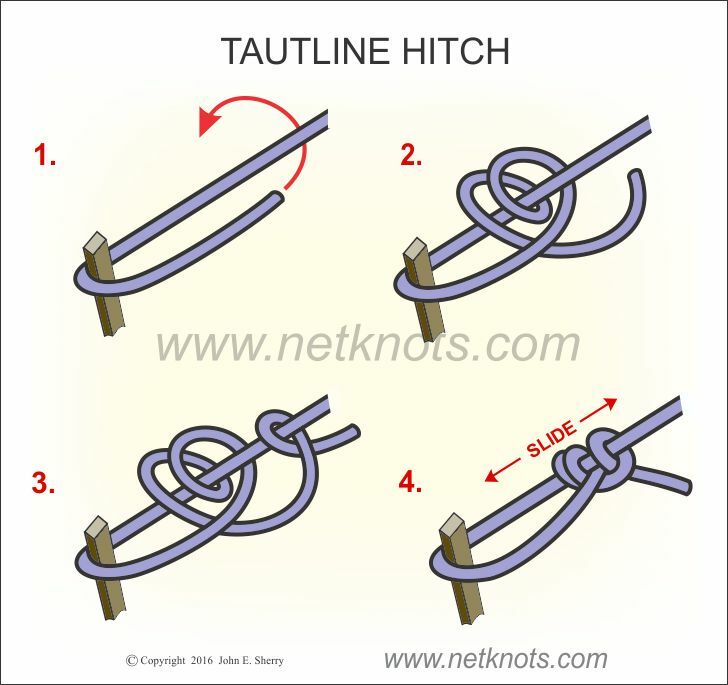 A tautline hitch is a great knot to know for tensioning guy ropes for masts as well as tents when camping. After erecting the antenna I checked the SWR and found it to be 1:1 at the bottom of the 6 meter band. I also found that the 2:1 SWR bandwidth was quite large and easily covered the SSB portion of the band. I also noticed that a nearby 6 meter beacon station that was typically an S3 on my collinear array was now an S7 on my quad turnstile, which is a huge improvement. The following day after getting the antenna on the air there was sporadic E band opening in North America and I was able to hear several stations. During this opening I worked my first 6 meter contacts, receiving good reports from stations in Oklahoma, Arkansas, Alabama, Tennessee, and Manitoba. Not too bad for 100W into an omnidirectional antenna in western Pennsylvania. I also worked about four hours of the June 2016 ARRL VHF Contest and made 20 contacts with stations in 14 grid squares. Like a lot of antenna systems, this one allowed me to contact most of the stations that I was able to hear. I have, however, gained an appreciation for why most people use directional antennas for VHF work. While the extra gain directional antennas provide would definitely be a positive, I can see now how favoring one direction over another can be especially advantageous on 6 meters. More than once I could hear multiple strong stations on the same frequency and with a directional antenna I could have significantly nulled out one of those stations in order to make it easier to hear and work one station at a time. Another advantage would be the ability to focus your signal in the direction in which the band is open, instead of broadcasting in all directions. With all of that said I am very pleased with how this antenna project worked out. This design is an inexpensive and effective way to get on 6 meters and make contacts which was my goal in the first place. It is also a good all around lesson in antenna design, construction, and phasing lines. Wonder what would be the effect of a metal mast? If non-conductive is required how far beneath the antenna might it need to extend? Thanks for any inputs you might have to share. I would think a metal mast would have some effect, but I think it would be hard to estimate how much without trying it. If the metal portion was solely below the feedpoint I think any effect would be very minimal. I believe you can forego the phasing network by making 1 of the loops ~1.025 wave and the other ~.975 wave. And get a boost on the bandwidth too. A “turnstile fed” turnstile. With the feedpoints of the loops at the bottom, I’m guessing this is a horizontally polarized antenna. Is that right? Correct, the antenna in horizontally polarized.